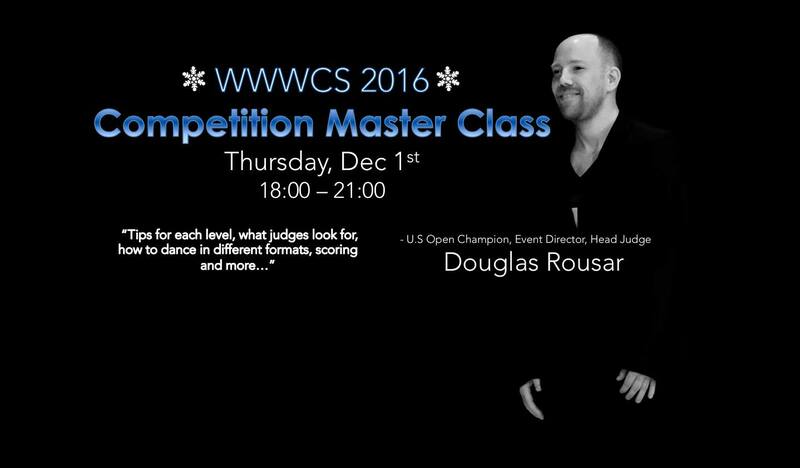 Douglas Rousar will hold a master class Thursday Dec 1st as a pre-Winter White course on understanding competition settings in all levels. Doug will cover different topics on all aspects of competing, such as technique, musicality, Jack and Jill's, judging etc. You will learn what judges are looking for and what stands out most on the competition floor. Additionally, you will learn about how to dance in different formats, levels, scoring and much more. Click here to learn more about Doug. To register and pay for the Master Class, click on the button below. Note: Clicking on the link will bring you to a different website. Make sure you are paying for the "WWWCS 2016 Competition Master Class".